Are you always up on the newest tech? It seems like something new and impressive is always coming out! Refrigerators can tell you when you're almost out of milk. Watches can let you know when your sleep pattern is off. You can even find a cat bowl that will keep their water fresh and bubbling at all times. But we have one issue with all the smooth moving, computerized accessories. None of this tech includes any kind of cogs or keys or steam. We were hoping that the future would be just a little steamier! This brass key will be the perfect topper to your Steam Punk ensemble. 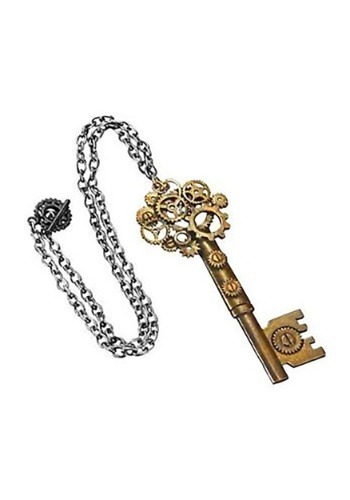 It has a long chain with a cog filled head and a skeleton tip. The clasp has a toggle so you don't have to fit it over your hairstyle when you slip it on your neck. Are you ready to bring steampunk into your look? We have so many gorgeous outfits with bronze and leather details, just like you might see in comics and books. Whether you're heading out to a Steampunk themed get together or you're thinking about creating an awesome character for Halloween, this little detail will make your look complete!